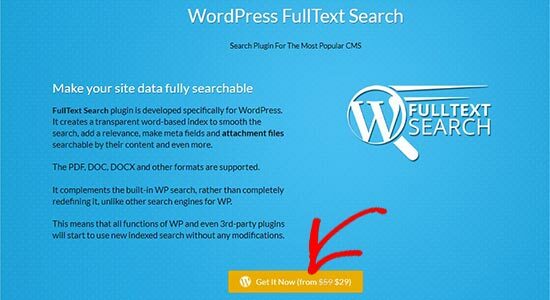 FullText Search is an advanced WordPress search plugin. Once installed, it improves your website’s search capability. It supports PDF, Docs, and other file formats to display them in the search results. FullText Search compliments the built-in WP search rather than completely redefining it which means it works great with third-party plugins. The best part is that WPBeginner users can get 15% OFF on the purchase of FullText Search using our exclusive FullText Search coupon code. How to Use FullText Search Coupon Code? WPBeginner’s exclusive FullText Search coupon code helps you get 15% off on the WordPress search plugin. All you have to do is follow our instructions below to properly redeem FullText Search coupon code, so you can get the best discount on FullText Search. First you need to visit the FullText Search website using our link on WPBeginner and click on the ‘Get It Now’ button. Click on the ‘Apply Coupon’ button and then click on the ‘Proceed to Checkout’ button below. On the next page, you can enter your billing details and account information to complete the purchase. We hope you found our FullText Search coupon code to be helpful. At WPBeginner, we work hard to negotiate exclusive discounts for our users.